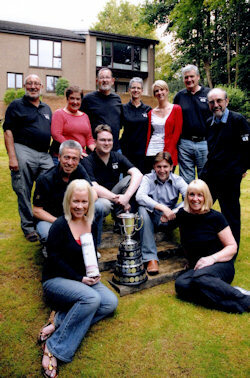 A TEAM of Scottish actors sponsored by BenRiach have become British champions. Falkirk's Tryst Theatre were crowned the best in the UK at the culmination of a nationwide drama festival involving over one thousand theatre groups. The team fought off challenges from the top English, Welsh and Northern Irish teams to lift the coveted Howard de Walden Trophy in Swindon's Wyvern Theatre. Tryst’s three actors performed Act One of the comedy “Art” by Yasmina Reza. Adjudicator Mike Tilbury praised Tryst's performance for its polish and professionalism and said: "This was acting of the highest standard - slick, comedic and highly entertaining." Tryst Director Alan Clark said: “We are very grateful to Alistair Walker and BenRiach for their generous sponsorship. With all the costs we faced in getting to Swindon, we couldn’t have done it without them.